So long, 2017! It was a busy year with ups and downs and lots of miles in between. My pile of "finishes" is not as extensive as in previous years (or as I would like), but there are a few completed projects for which I am proud and several wonderful experiences in which I'm happy to have taken part. Here's a photo montage and a recap. 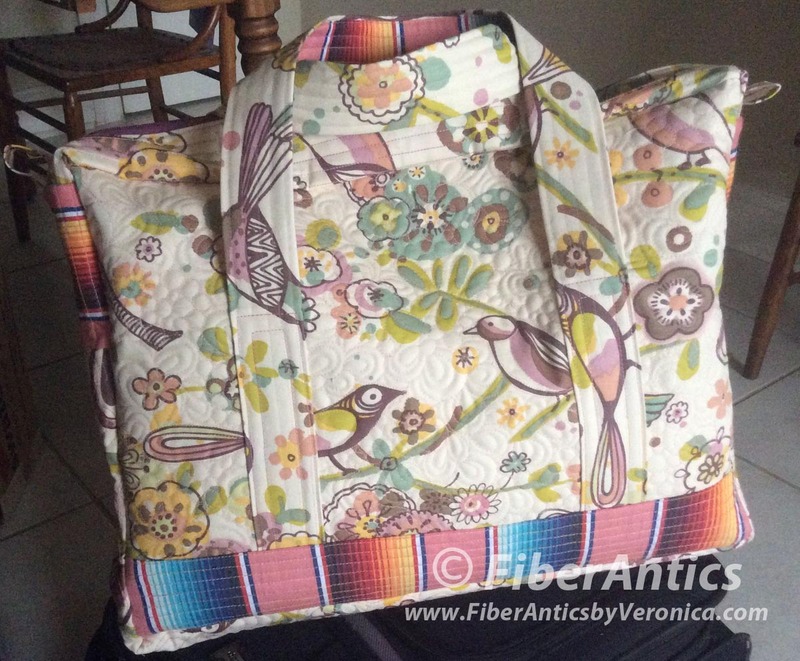 Cargo Duffle, improv pieced mug rug, Cargo Duffle briefcase. A jacket inspired by vintage textiles. My enthusiasm for garment sewing and creating artwear pieces has been renewed—due in large part to the fabric companies I represent that offer fabulous, high quality woven and knit fabrics that are great for sewing clothing as well as quiltmaking. When ya work with "the good stuff," you're more inspired, the projects come out so much better, they wash and wear well, and the "making process" is waaaay more enjoyable. Oh... and you don't look like the run-of-the-mill chain store Jo (or Joe). We're all different and unique! Let's not dress like twinsies. I made two jackets this year that I am pleased with the results. I get lots of compliments on them, too. 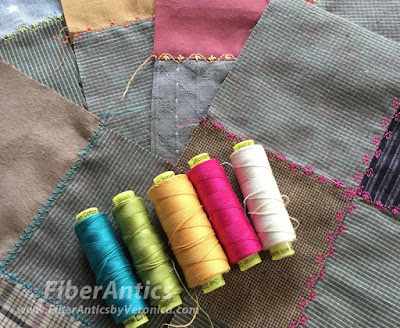 Each one coincided with an industry trade show (Spring and Fall Quilt Markets) and feature the luscious yarn-dyed wovens from Diamond Textiles. No doubt it was a firm deadline that facilitated these projects into the "completed" column. "There's nothing like a deadline to get one motivated," as the saying goes. I also have a selection of knit tops—short and long sleeves—made with Art Gallery knits. 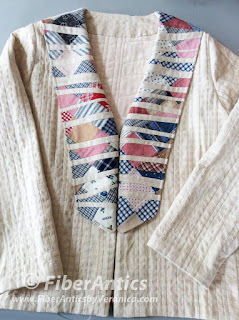 Ikat jacket with Primitive Stars fabric. 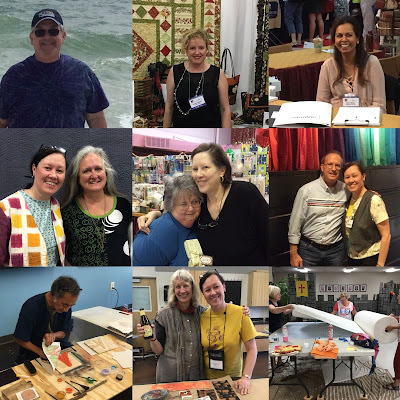 In the Spring of 2017, my quilt guilds brought author and award-winning quiltmaker, Mary Kerr, to Chattanooga for workshops and a lecture. Mary has written books about incorporating vintage textiles and antique quilt blocks into new quilts. 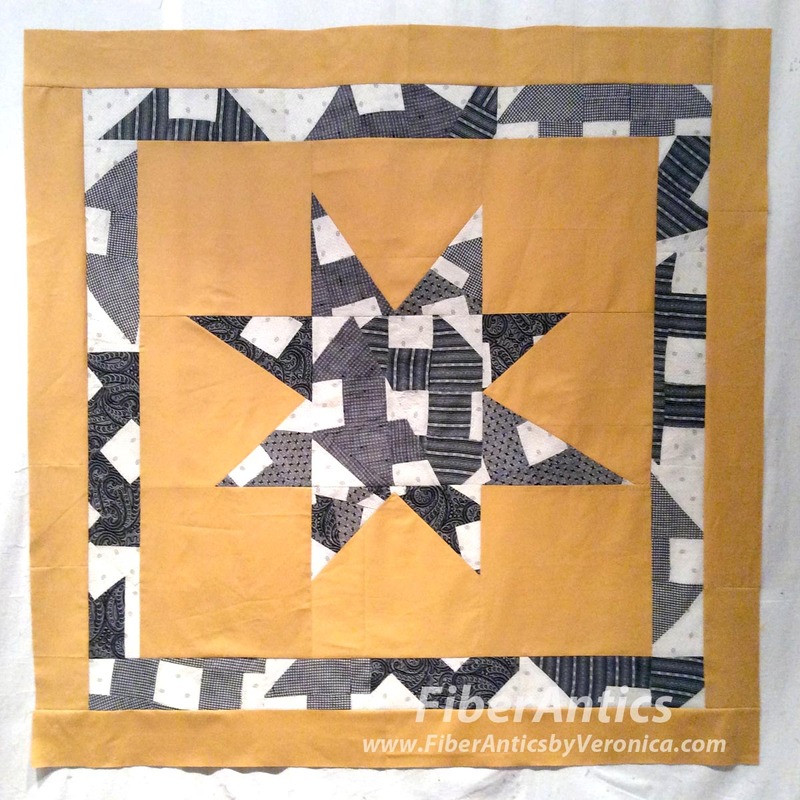 The collar on the white jacket (shown above) and this Vintage Wonky Star quilt top (below) were the results of Mary's visit. It was fun to collaborate with the anonymous quilters who made and left behind the original quilt blocks. 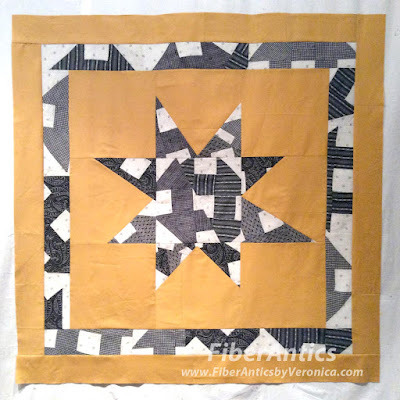 Vintage Churn Dash quilt blocks made into A Wonky Star. 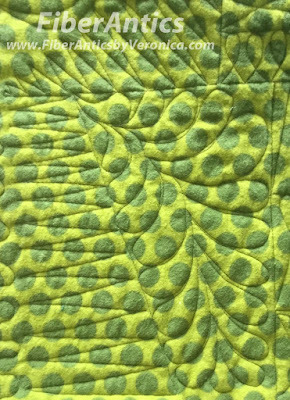 An unquilted quilt top made in a workshop with Mary Kerr. 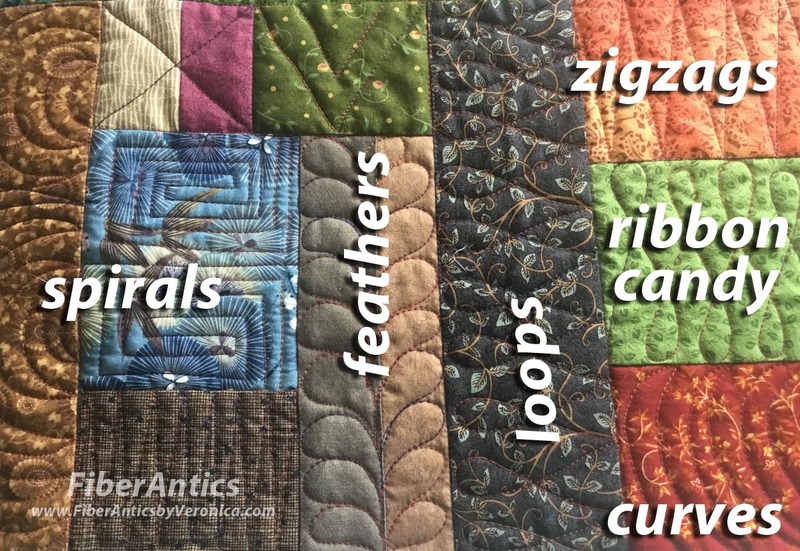 I expanded my free-motion quilting to include a new substrate—canvas. I used the Cargo Duffle pattern (with mods) from Noodlehead to construct two zippered bags. I rep two companies—Alexander Henry and Art Gallery Fabrics—that offer cotton canvas fabrics. Variation of Cargo Duffle with canvas fabric from Alexander Henry Fabrics. Stripe fabric from Diamond Textiles. The variegated 50 wt. cotton thread [Tutti from WonderFil Specialty Threads] is still one of my favorites. The contrast striped fabric is one of the World Fabrics from Diamond Textiles. 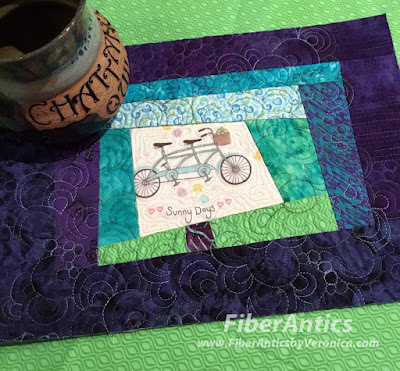 Free-motion machine quilting on canvas with variegated thread. Canvas: Alexander Henry fabrics, Thread: WonderFil Tutti 50 wt. WonderFil's 12wt. 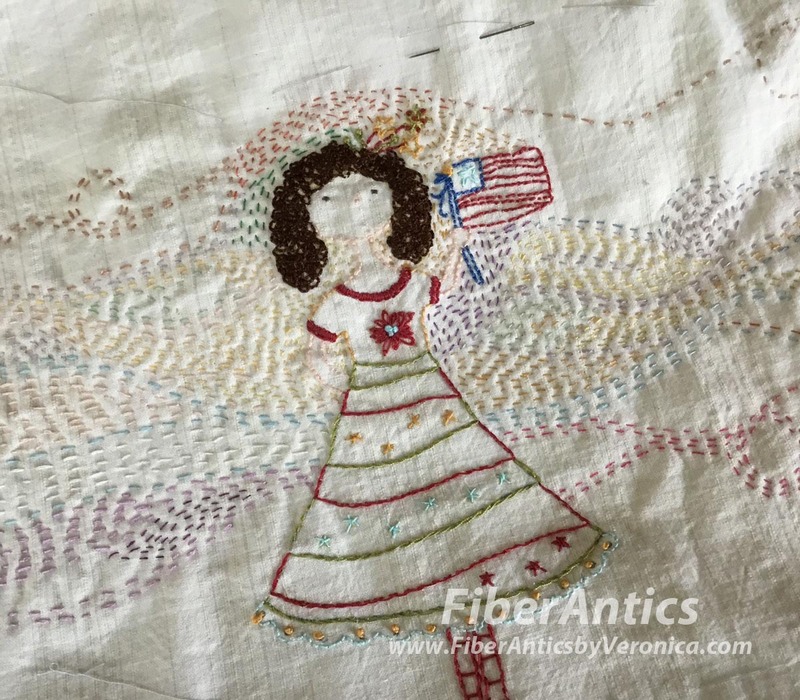 cotton thread [Spaghetti] prompted experimentation with machine decorative stitches. The 4-patch blocks are made with the versatile yarn-dyed wovens from Diamond Textiles that were also used in my jackets. on yarn-dyed textured wovens by Diamond Textiles. Inspired by a studio intensive workshop with Dorothy Caldwell, my take-along travel projects now involve hand stitching. 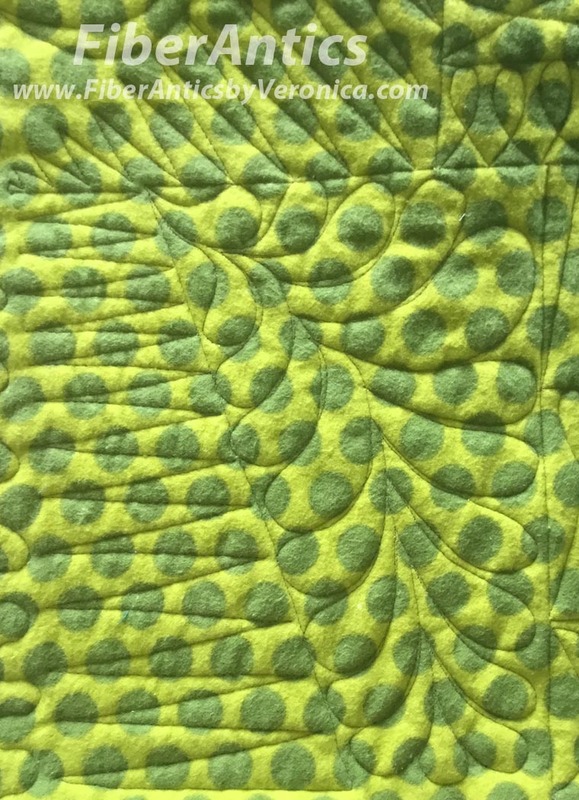 Kantha stitched cover for Mark Making book from Dorothy Caldwell workshop. Although the stitching on my patriotic girl is now complete, I haven't decided if this piece will become a pillow or a small quilt. 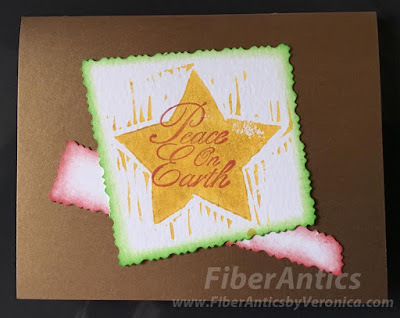 Hand embroidery with ArtPlay Stitcheries from ADORNit. The background of the embroidery is filled with kantha stitching. The base fabric: yarn-dyed woven from Diamond Textiles. I was able to make a few kitty quilts for the kitties at The Cat Clinic. Making these and bringing them to the Clinic warms my heart. 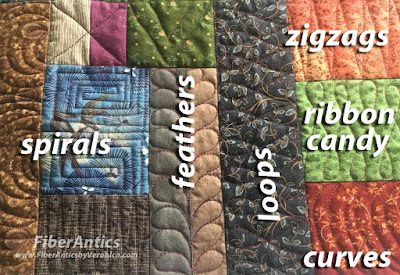 The quilts are always appreciated—by the staff and the cats. 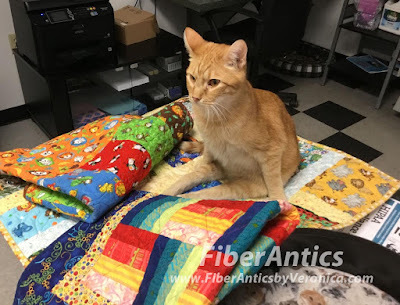 Jesse inspects the kitty quilts donated to the kitties at the Cat Clinic. Both of my quilt guilds were generous with their time and resources in 2017. 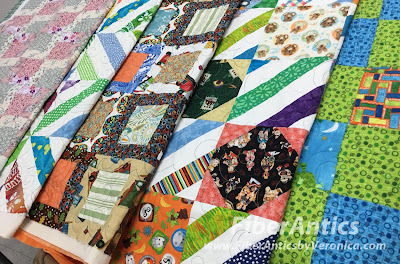 I don't think I completed any cuddle quilts all myself, but I donated a bag of fabric swatches to my quilt guild for a year of "Make Do" and improvisational patchwork. The swatches found their way into quilt blocks I pieced and several charity quilts our guild members worked on together. Cuddle quilts quilted at the Choo Choo Quilters annual workshop. At our annual Cuddle Quilt workshop, I was able to free-motion quilt 5 cuddle quilts, so I was part of the team effort. I supported the other guild with a quilt top for a Re-mix Exercise. This quilt will be donated to Chattanooga's Habitat for Humanity organization. 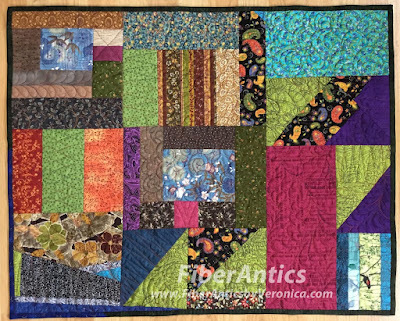 The finished quilt can be seen here. Leesa Chandler from The Textile Pantry; Rohni Sandu from Diamond Textiles. Row 2: Me and Mary W. Kerr; representing all shop owners is Donna Sandidge (right); Patrick Lose and I.
friends from my quilt guild at our Cuddle Quilt workshop. I have also had the pleasure of being inspired by the students who attend my classes and my fellow classmates who have been in workshops alongside me. 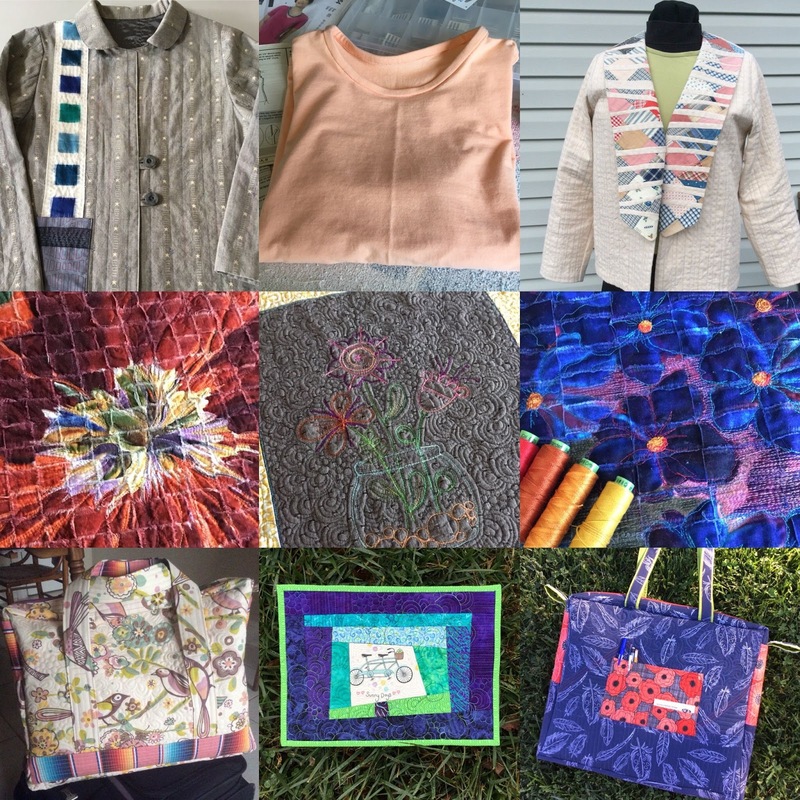 And, it's a pleasure to work with owners and associates of numerous quilt shops and independent sewing centers this past year. These shop owners are some of the hardest working, dedicated, small business people around. Please support them! Follow your passion and work at your craft. Wishing you much creativity and inspiration in 2018. It could be right over the next hill or around the next bend in the road. It's gratifying to give handmade gifts. However, it's that time of year when time is at a premium and everyone is so busy. Here are ideas for gifts that are thoughtful, distinctive, useful, fairly quick to make and are sure to "fit" anyone on your list—regardless of their size. Mug rugs: one size fits all. Personalize this gift by using fabrics that reflect the likes, hobbies or favorites colors of the recipient. Mug Rugs can be coaster size or something a little bigger. Mine here is 11" x 8". 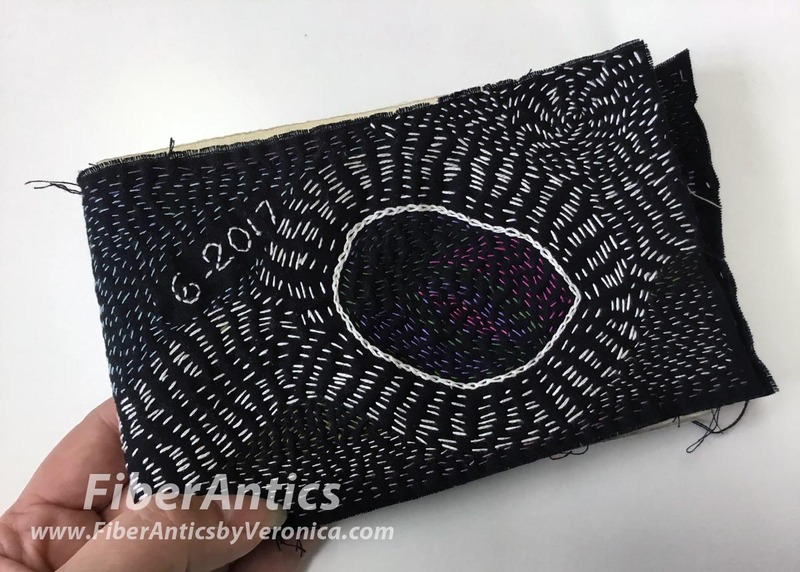 I received a mug rug several years ago from Linda, one of my ATC swap participants, and I use it all the time in my studio. I smile and think of Linda every time I see it. This is one of my favorite gifts to give! Pillowcases are easy to sew for the maker and a useful gift the recipient will use over and over. She/he will think of you and your thoughtfulness every night when going to bed. Stash-busting and improvisational piecing go hand in hand with gifts like placemats and table toppers. If you have an idea of the person's decor, search your stash for colors and styles that will complement it. Placemats: improvisational piecing and free-motion quilting. 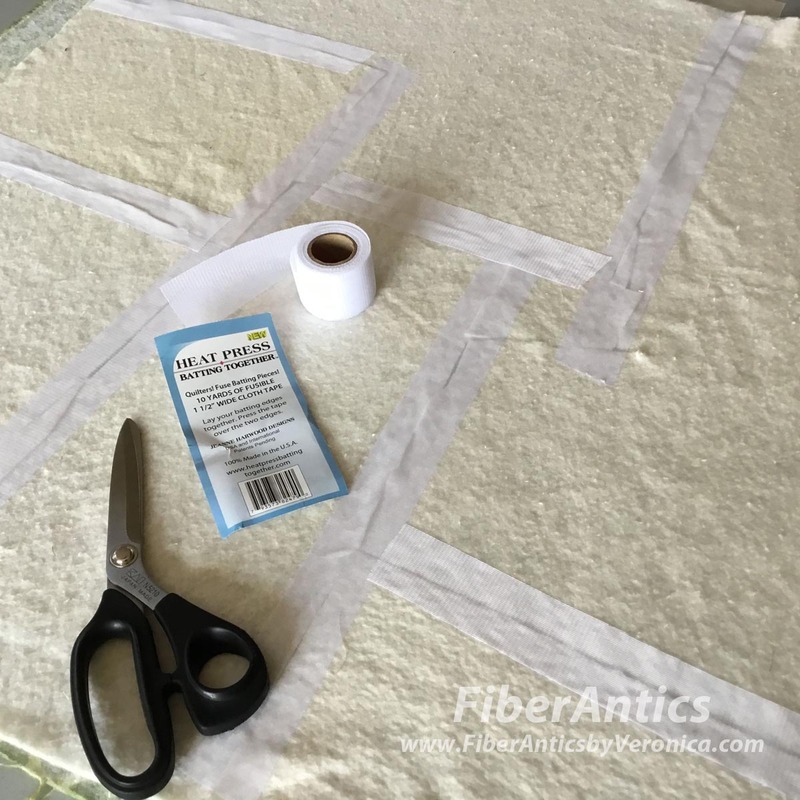 For even faster turn-around, there are pre-printed placemat and runner fabric panels perfect for these projects. Visit your local quilt shop (YLQS) and ask. 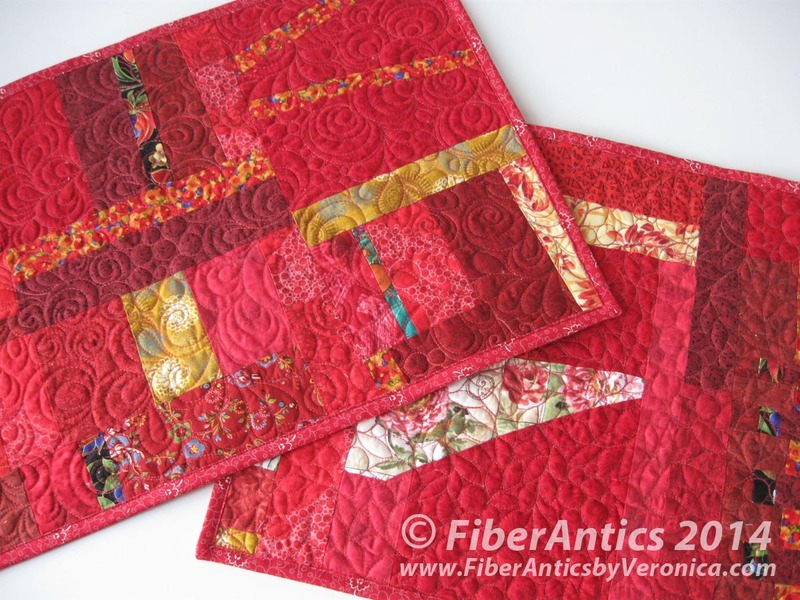 The quilting and your choice of a binding will add the personal touch. 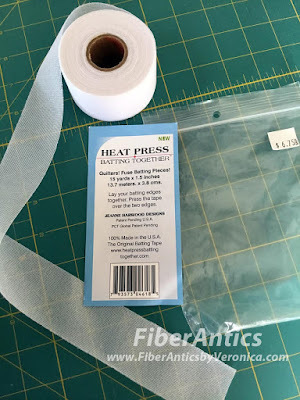 fabric drawstring bags (I use these for my slippers and shoes when I travel. Much nicer and quieter than plastic bags!). This is a short list of one-size-fits-all gift ideas. Check YLQS for other ideas and suggestions. These projects may be quick to make, but these gift items are personal, thoughtful and one-of-a-kind. You can't get these items at the mall! Another bonus is for you, dear maker! 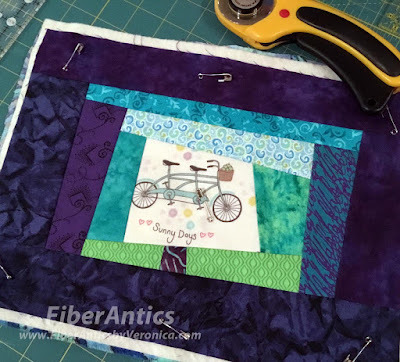 You get to spend a little time at the sewing machine, practicing your free-motion quilting (on smaller size pieces). At this time of year, we need to do a little therapeutic stitching to combat all the craziness. Isn't that right, my blogger stalker?? 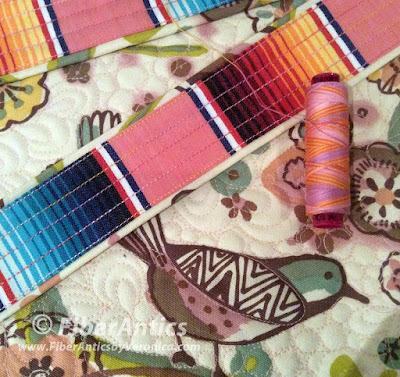 Mug rug is pin-basted and ready for free-motion quilting. 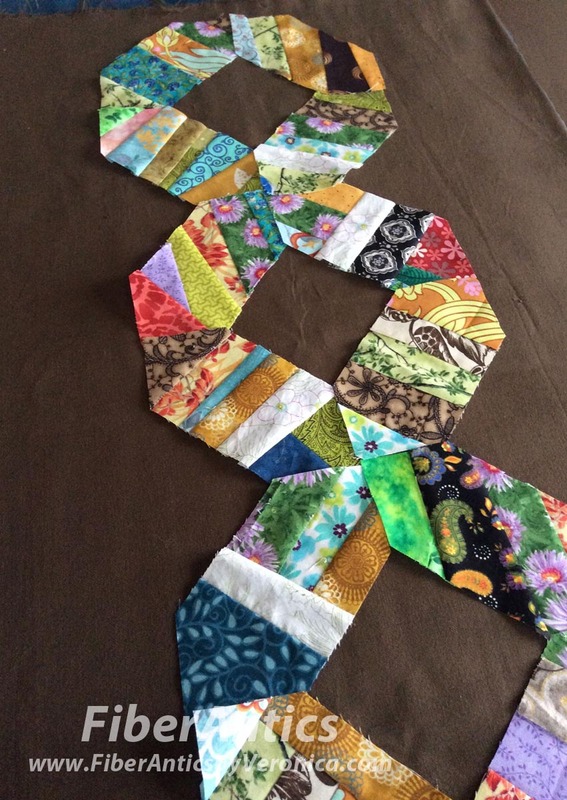 Sometimes we want to fill a specific space on a quilt with a quilting motif. It could be an alternate block, a setting triangle, sashing or other defined space. 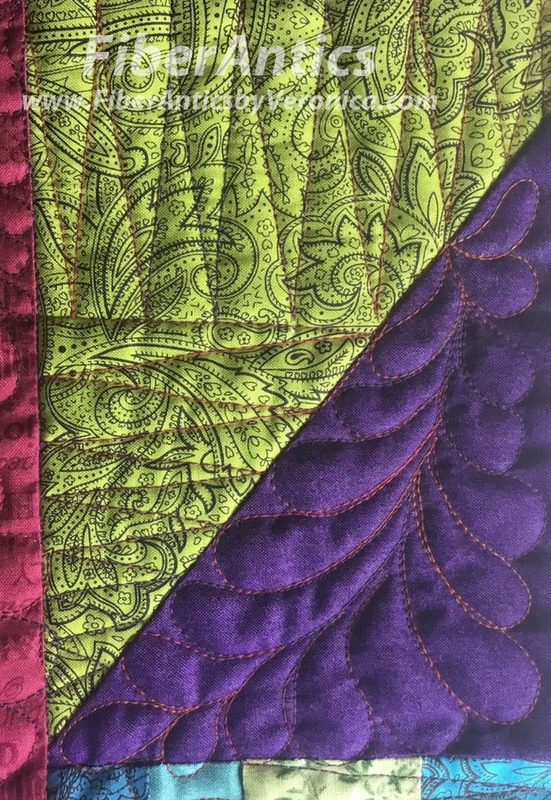 Why not practice free-motion quilting and filling shapes using improv patchwork? 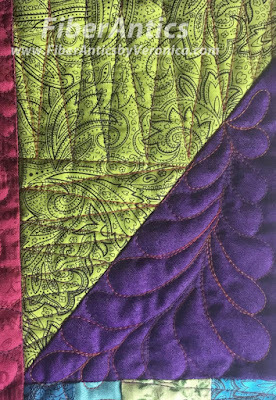 Filling defined shapes and spaces with free-motion quilting. 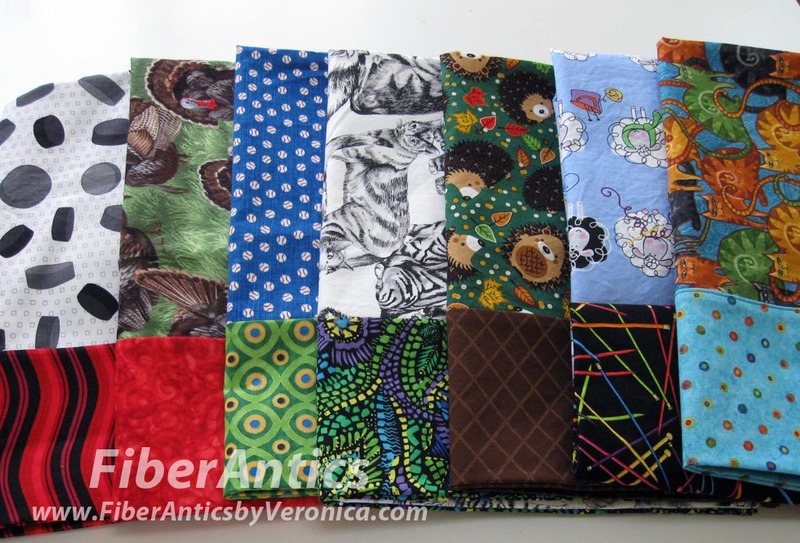 This improv quilt is for Jesse The Wonder Cat and the kitties at The Cat Clinic. The improvisational patchwork actually has parts of a fabric handbag that never made it to the quilting stage, so I decided to repurpose the pieces for the kitties. Other improv blocks were incorporated to make the top to size. The "handbag" kitty quilt, 30.5" x 25"
When I sit down to quilt these small format quilts, I decide on a technique or motif I need to practice. With the larger blocks and a variety of sizes of squares, rectangles and triangles, this quilt top was a good canvas for fillers and motifs in defined spaces. Moving from section to section, I also got in practice for ditch stitching. 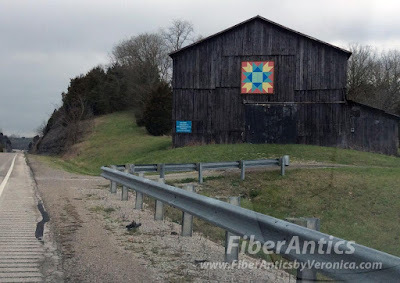 You can see the outlines of the shapes (stitching in the ditch) more clearly from the back. These kitty charity quilts have an abundance of potential for practicing free-motion quilting. And the kitties love them! Enjoy the antics of the special kitties, Jesse the Wonder Cat, Silly Willie the Super Scooter, Good Golly Miss Dolly that reside at the Cat Clinic of Chattanooga. And if you're thinking about opening your heart to a furry friend this holiday season, there are many cats and dogs that need forever homes. Contact your local shelter to inquire.